In today’s energy-conscious data center, efficient server design pays big total cost of ownership (TCO) dividends by balancing power consumption, performance, and shelf/floor space. It’s astounding that a majority of servers on the market rely on commodity motherboards and power supplies designed off-shore only for lowest price at the expense of whole-system energy efficiency and rack density. Apex codifies everything we know about military reliability, security, and SWaP into a rackmount server. 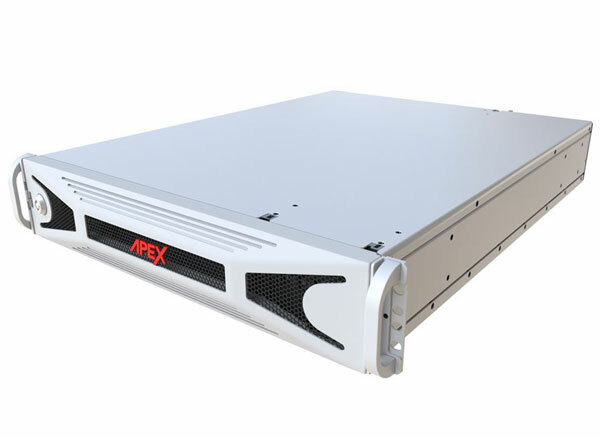 Apex, by General Micro Systems (GMS), is a revolutionary 2U short rack (22-inch) modular blade server system designed for subsystem modularity, maximum performance at Gen 3 speeds (8 Gbps), flexible add-in, and add-on options—all based upon VPX interconnects with military system reliability. Applied to defense, high-reliability, or enterprise applications, Apex replaces up to 17U of equipment in a mere 2U height yet still offers the ultimate RAS (reliability, availability, serviceability) in a single-box delivering total-rack performance. The Apex 2U server system is intended for commercial/industrial/military/defense/aerospace and is designed to do more than “check the boxes” on processor, memory and I/O requirements. Combining CPU, RAID NAS with direct-to-disk NVMe SSDs, Ethernet switch and router, APU, and PCIe add-in I/O into only 2U saves rack space while reducing the aisle load on power and cooling. Apex also “extends” outside the server’s box into other chassis—when there’s need for more I/O or algorithm processing—via the XPANSE™ module and FlexVPX™ backplane that closely couples together every subsystem within Apex. Properly configured, the server runs bare metal virtual machines, virtualized networks, and software-defined storage. The latest 22-core Intel® Xeon® E5 v4 processors are coupled with up to 1 TB of DDR4 RAM for a massive 88 virtual machines (VMs), high-performance cache look-up and database transaction processing. GMS’s patent-pending internal FlexVPX™ multi-dimensional switch fabric matrix pipes data at 8 Gbps wire speed to all of Apex’s modules simultaneously to maximize transaction processing, packet processing or storage IOPS. Software-defined networking (SDN), software-defined storage (SDS), and network functional virtualization (NFV) are handled all in one box and in a mere 2U—making Apex the most space- and energy-efficient server on the market. Onboard 10 and 40 Gb Ethernet ports are the industry’s fastest.